Mauna Loa Tribute Mug BA795 Free Shipping. 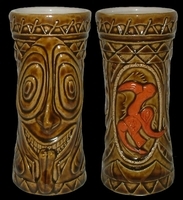 Mauna Loa Tribute Mug This mug pays tribute to the vintage Mauna Loa mug and is also one of the winners from our 2007 Tiki Central design contest. Featuring the same lashed drum top of the vintage mug & featuring a glazed orange Dodo bird enshrouded within an oval glazed tan faux rope border. This is the design of Timothy Steger, aka "Tiki Nomad". The mug measures 6 3/4" in height and holds 13 oz.